Idaho’s post-recession job growth gained steam during the past two years, with the recovery concentrated in the state’s 11 metropolitan counties. 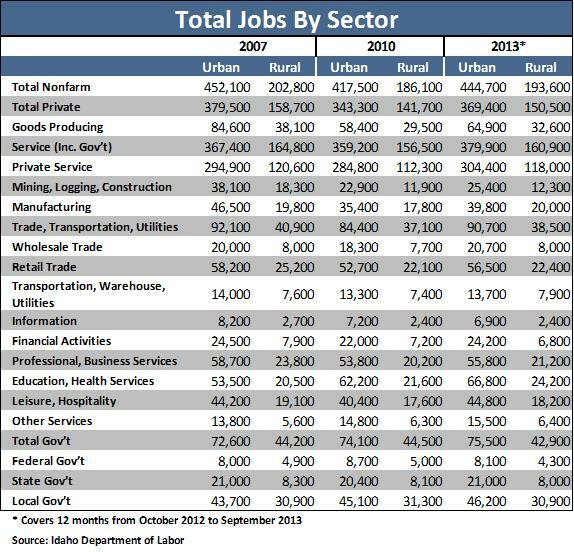 The U.S. Bureau of Labor Statistics estimates the state lost over 50,000 jobs from 2007 to 2010, two-thirds from the traditionally better-paying goods production sector. Idaho’s 33 rural counties – those not part of a federally designated metropolitan statistical area – lost a slightly higher proportion of jobs than urban counties, but those same rural counties hung on to many more manufacturing jobs than metro areas. In 2007 before the recession, Idaho’s rural counties accounted for 31 percent of all jobs – about 203,000 – while the 11 urban counties accounted for the other 452,000. By the time the recession ran its course in 2010, the state’s rural counties held 186,000 jobs, or 30.8 percent of the statewide total, while the urban counties had 417,500. Seven of every 10 urban jobs lost to the recession were in goods production while the split between goods production and services in the rural counties was about even. Through 2013, the state recovered two-thirds of those lost jobs but not in the same sectors. Only about one of every four goods production jobs was recovered while three service-sector jobs were generated for every two that were lost. And while manufacturing has been a bright spot in recent years, economic recovery in rural Idaho has been slower overall. Construction bore the brunt of the recession throughout the state. Urban counties lost 40 percent of the construction workforce – over 15,000 jobs – while rural counties lost 38 percent – nearly 6,000 jobs. That translated into $767 million in lost wages statewide – $586 million in the metro areas and $180 million in rural Idaho. And while economic recovery has slowly begun in Idaho’s urban areas, the increase in construction jobs since 2010 has been just over 600 – all in urban counties while rural areas continued shedding jobs. Only a fraction of the lost wages had been regained in the metro areas. In manufacturing, rural counties not only regained 2,100 jobs lost to the recession by 2013 but another hundred while urban areas recovered 3,700 of more than 11,000 manufacturing jobs lost. Statewide all of the lost manufacturing wages were essentially recovered by 2013 but only because of growth in food manufacturing, primarily in south central Idaho. Twelve hundred manufacturing jobs have been generated in that region alone since 2010, with total manufacturing wages nearly $100 million higher than in 2007 before the recession hit. At the end of 2013, Idaho’s 11 urban counties were still $150 million short of their manufacturing payroll peak prior to the recession. By 2013, over 34 percent of Idaho’s goods production jobs were in rural areas, up from 31 percent in 2007 and total payroll reflects that shift. Since the bottom of the recession in 2010, total goods production wages in the rural counties have risen 14 percent while the increase in the metro areas was under 10 percent. A significant growth in service sector jobs has been concentrated in the 11 metropolitan counties, where all 3,800 leisure and hospitality jobs had been recovered along with 600 more, and both trade and financial services were nearly back to prerecession levels. In contrast, Idaho’s rural counties were still well below half in recovering service sector jobs except in transportation, which was several hundred jobs ahead of its prerecession peak. In total wages, service sector payrolls in rural Idaho have risen 5.8 percent since 2010 while the increase in urban counties was 8.3 percent. Overall, the metro counties saw total wages decline 6.4 percent during the recession while the loss in the rural parts of the state was just four-tenths of a percent. The recovery has more than restored all the lost wages statewide, but total wages in 2013 were just 1.7 percent higher than the prerecession peak in the urban counties while they were over 7 percent higher in rural Idaho. This entry was posted in Employment News and tagged idaho department of labor, idaho economy, idaho jobs, rural, urban on June 10, 2014 by Idaho Department of Labor.